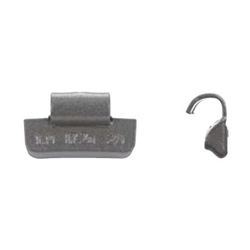 I7Z Type Zinc Clip-on Coated Wheel Weight 1-1/2 oz BOWES WW I7Z-015 BOX OF 25. The I7Z-Series zinc clip-on wheel weight is the most popular wheel weight for medium and heavy-duty trucks. It is used on the majority of trucks with tube-type tires. Please use rim gauge (RG2) to verify specific applications.